If there is a forecast for a downpour of cash and a deluge of credits then maybe Noah’s Ark Slot is the game for you? In the biblical narrative God told Noah to build the ark in order to save his family and the worlds animals because he was going to cover the earth in water – nice chap. 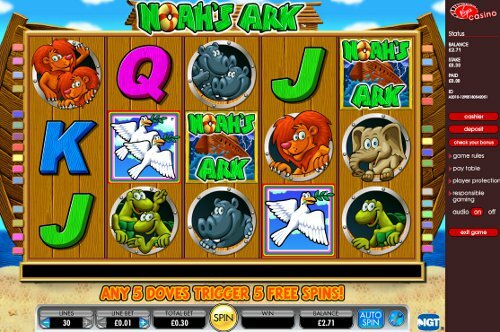 The animals may have went into the Ark two by two but in this fantastic online slots game we expect you would like the money to come out in larger portions? Noah’s Ark is a five-reel, 30-pay line slot machine game with a bonus feature called the Split Symbols feature. You can play for free or for real money and if you choose the latter you can play with denominations as low as 1p or as high as £30 per line bet. In the game each animal symbol comes in two varieties: single symbols and double symbols. The single symbols contain one animal and the double symbols contain two. You can win more prizes by matching more and more animals on a pay line. This feature is enhanced by the Noah’s Ark Logo symbol. This symbol is the WILD symbol and can substitute for the highest paying animal symbol or highest paying royal symbol that completes a win. The split symbols feature lions, elephants, camels, tortoises and of course hippopotamuses. But lets just hope the hippopotamus doesn’t get stuck in the door!